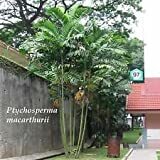 Ptychosperma macarthurii growing palm tree of the genus Ptychosperma also known as Macarthur palm, Ptychosperma macarthurii perennial evergreen plant, used as ornamental plant, can grow in tropic, mediterranean, subtropical climate or as houseplant and growing in hardiness zone 10+. Flower color yellow or green, small flower with bigger stamens that grow connected on stems. 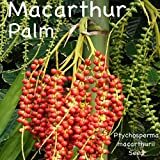 Home Comforts Acrylic Face Mounted Prints Tree Ptychosperma Macarthurii MacArthur Palm Palm Print 14 x 11. Worry Free Wall Installation - Shadow Mount is Included.